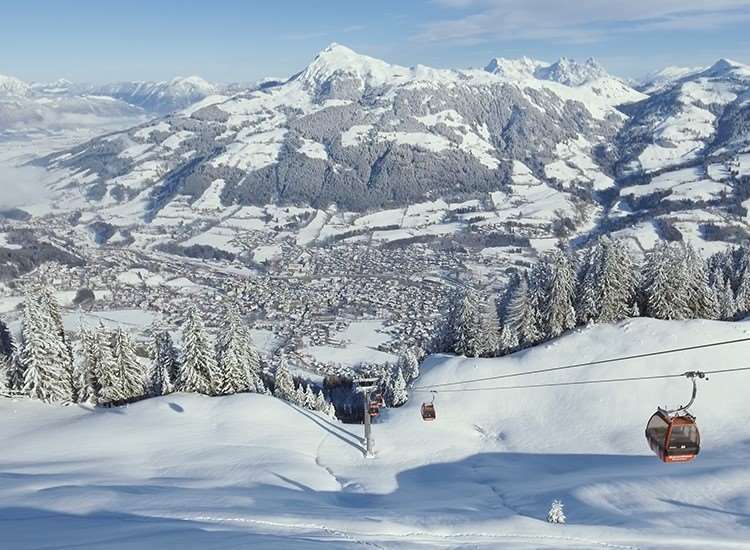 Kitzbuhel is absolutely synonymous with Austrian skiing. Situated in a ‘snow corner’ of the Alps, the fashionable resort of Kitzbühel presents a state of the art ski circuit covering 185 km of pistes. Famous above all for the Men’s Downhill Race on the Hahnenkamm, this lively and sophisticated resort has something for everyone, from young to old and from beginner to expert. Non-skiers on a ski holiday in Kitzbühel can enjoy well-prepared walking paths or join an excursion to the historic cities of Salzburg or Innsbruck. Dating back to the 14th century, Kitzbühel’s painted medieval houses, stylish shops, concealed passageways and charming cafes are fascinating to explore. Kitzbühel is often regarded as an ‘up market’ or ’swanky’ with its designer shops, superior lift system and rich heritage but it still has the friendly Austrian spirit at it’s heart which makes Kitzbühel great for families. 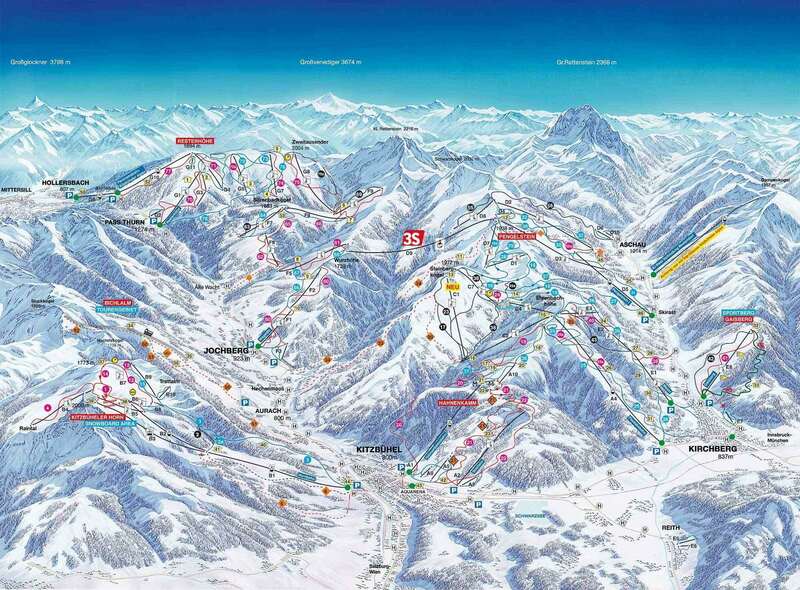 The ski area is spread over 2 mountain sides, the majority of the ski area is located up the Hahnenkamm, where you can ski all the way down to Kirchberg and Aschau, plus all the way over the 3S gondola to the Pass Thurn side. The second ski mountain is the Kitzbüheler Horn which only has a handful of pistes, but it is quieter making it a brilliant beginner ski area. An excellent free bus system operates through all the villages across the Kitzbuhel piste map. There is a regular bus that runs between the Hahnenkamm gondola and Kitzbüheler Horn, and buses that run throughout the day from Pass Thurn back to Kitzbuhel town (less frequent during the middle of the day), allowing you to catch the bus back if you don't have the time to ski across to the 3S gondola. There are 185 km of pistes spread across the mountains plus 41 km of ski routes and 4 km of special areas (snowparks, funslopes, etc). Powder lovers and freeriders will love the Kitzbuhel terrain. There are many slopes with deep snow below the tree line, wide powder fields and tree line routes making it an off piste paradise. With so many opportunities it is always best to book a guide or instructor to take you to the best spots on the mountain. Kitzbühel boasts 200 days of snow security every ski season. Since 2000, 150 million Euros has been invested in snow making facilities, improving the slopes and new lifts to retain the world class status of this ski area. Like many Austrian ski resorts there isn’t any ski chalet accommodation available in Kitzbühel but there is a range of hotel options to suit most budgets. The best value is Hotel Aurach that is located 10 minutes outside of Kitzbuhel town, this may put people off but there is a regular bus service that operates during the day into Kitzbuhel or Pass Thurn and taxis are readily available in Kitzbuhel town if needed. Hotel Tiefenbrunner, Hotel Maria Theresia and Hotel Schwarzer Adler are stylish Austrian ran hotels located near the town centre. The main train station is located next to the Hahnenkamm gondola and provides regular train journeys to nearby towns and ski resorts including St Johann, Zell am See/Kaprun, Westendorf, Fieberbrunn, Hopfgarten and more, allowing you easy access to discover other ski areas during your ski holiday in Kitzbuhel. There is a large variety of non-ski activities to do in Kitzbühel that make it a great choice for families or groups with non-skiers. The world famous ski resort of Kitzbuhel has some of the best skiing in Austria, with fabulous scenery and awesome nightspots. Not only does it attracted hundreds of budding skiers as the host of the World cup ski races and welcomes people to challenge the famous 'Streif' slope - considered the world cup circuit's toughest event - the Thurn Pass is one of the largest ski regions in Austria making this a perfect resort for those less competitive and more interested in cruising the kilometres of piste and relaxing in a deckchair with a hot mug of Gluehwein. A picturesque resort complete with friendly characters and an atmosphere made famous by the World Cup Downhill and typical Tyrolean setting. There are few sights and sounds as evocative as watching racers complete the fearsome course, with Kitzbuhel's stunning scenery in the background.